ROME (CNS) — A medieval Franciscan convent near Assisi opened its doors once again to offer refugees shelter and assistance. With the support of the Order of Friars Minor in Umbria, the local Caritas will provide educational, cultural and language assistance to 13 men from Senegal, Ghana and Nigeria. The Franciscans in Assisi have been working to make their lodging and residential properties — mostly convents — throughout Umbria available for such efforts, they said in a press release April 5. “Welcoming refugees represents a work of mercy — called for also by the appeals of Pope Francis and the entire provincial fraternity,” the Franciscan order said. The refugees will move into the 15th-century Convent of “Santissima Annunziata” in the hills northeast of Assisi April 6 and live there for at least one year. The refugees, together with Caritas workers and the two Franciscans who live at the convent, will help with the convent’s upkeep and preparing meals. The same convent had been the temporary home for 16 Muslim and two Catholic refugees for almost two years between 2011 and 2013. That initiative also involved the collaboration of the Franciscan province and the diocesan Caritas. Just months after his election in 2013, Pope Francis had said church buildings that no longer house nuns, friars, monks and other religious should be used to shelter refugees. 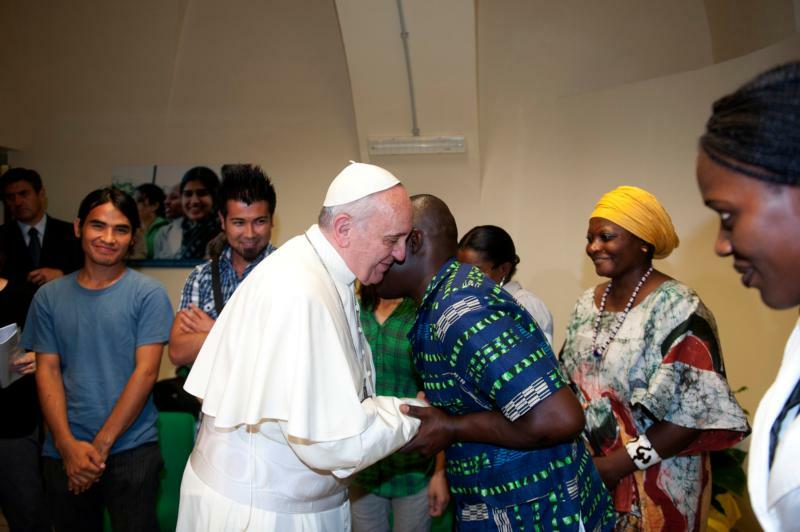 “Empty convents and monasteries should not be turned into hotels by the church to earn money,” he said when visiting the Jesuit Astalli Center for refugees in Rome in September 2013. The buildings “are not ours, they are for the flesh of Christ, which is what the refugees are,” he had said. Two years later, the pope called on every parish, religious community and sanctuary in Europe to take in one refugee family to help respond to the massive influx of peoples coming especially from war-torn Syria. The Vatican’s St. Peter’s Basilica and St. Anne’s parish helped sponsor two refugee families, offering them housing and assistance. The International Organization for Migration estimates that more than 1 million migrants arrived at Europe’s borders in 2015. However, many also enter undetected and the European Union’s border agency, Frontex, estimates that more than 1.8 million people arrived in Europe last year. More than 1.3 million people in Europe claimed asylum in 2015. The same day the Franciscans made their announcement, the Vatican confirmed that discussions were underway for Pope Francis to travel to Greece to visit refugees — mainly from Syria, Iraq and Afghanistan. The synod of the Orthodox Church of Greece invited both Pope Francis and Ecumenical Patriarch Bartholomew of Constantinople to visit Lesbos as the Greek government begins transporting the refugees back to Turkey in a deal worked out by the European Union. Cardinal Antonio Veglio, president of the Pontifical Council for Migrants and Travelers, told Vatican Radio April 4 that the agreement appears to ignore international recognition of the rights of refugees. With the EU paying Turkey in return for agreeing to accept the refugees, he said, the agreement treats both those fleeing persecution and those seeking a better life for their families as merchandise to be sold to the highest bidder.